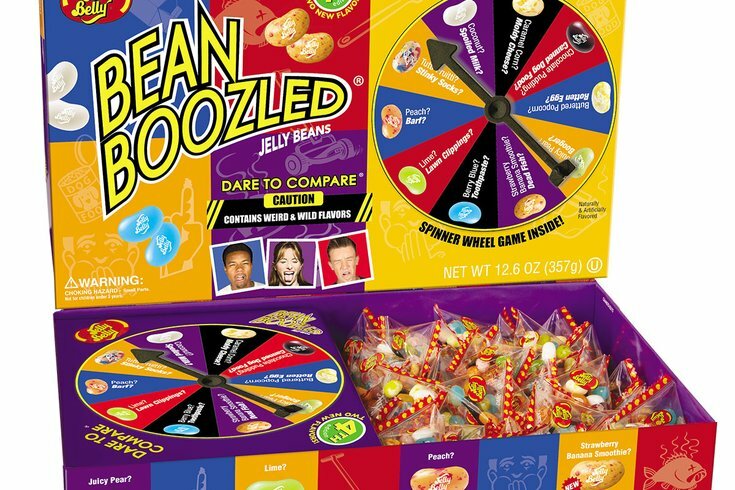 BeanBoozled jelly beans have flavors like "Booger," "Skunk Spray" and "Canned Dog Food." Jelly Belly has a gigantic hold on the jelly bean world. They are the most famous jelly bean manufacturers of all time and have been on the frontlines of jelly bean science for years, pushing the boundaries and blowing minds. They have jelly beans for everyone: regular flavors for the kids, Cocktail Classics for the adults, even Sport Beans and Extreme Sport Beans filled with vitamins and caffeine for athletic types. They also struck gold by teaming up with the “Harry Potter” franchise, creating sweet-tasting confections from the books and films like Chocolate Frogs and Jelly Slugs. Their big outside-the-box move was Bertie Bott’s Every Flavor Beans, which debuted in 2005. As in Potter lore, this assortment of candies offers “a risk with every mouthful.” Some taste like blueberry, marshmallow or cinnamon. Others taste like black pepper, vomit or earthworm. Despite the key on the back of the box, it wasn’t always easy to tell which flavor you were about to try. Needless to say, they were a hit. And, after effectively marketing dirt-flavored candy to children and making a fortune, Jelly Belly pretty much had to follow it up with something bigger. Hence, BeanBoozled, which is basically Bertie Bott meets Russian roulette. There are 20 flavors of jelly beans in a box of BeanBoozled but only 10 colors. So when you pop a light green bean into your mouth, you might get “lime” or you might get “lawn clippings.” The white ones are sometimes “coconut” and sometimes “spoiled milk.” An orange-ish bean is either “peach” or “barf.” And so on. The “gift box” version of BeanBoozled includes a spinner, so you can make a game out of it. I don’t have any children, but in my mind, this is the ultimate “stupid thing kids ask their parents for” product. There’s no other reason for it to exist. If you were a kid, you’d be like, “Of course I want to eat booger jelly beans!” And your parents would say no because you don’t need that and they’re not spending their hard-earned money on booger jelly beans and you’d be mad but they’re absolutely correct! You do not need to eat booger jelly beans. If I’d asked my dad as a kid for $5 so I can go buy candy that tastes like dog food, he would have asked me if I was on drugs. Nevertheless, they are popular because kids are relentless beggars. The Challenge got pretty bad and pretty heated. We argued a lot, gagged and generally had a bad time, which is the point of this candy, right? Coconut: Tastes like how an old man barbershop smells. Spoiled Milk: This will ruin your day and possibly your marriage. I refuse to eat this again. Baby Wipes: Only available in the third edition, though it tastes like an early, less-intense version of the Spoiled Milk bean. Also, I’ve never eaten baby wipes, so I can’t really compare. Tutti-Frutti: Weird mish-mash of flavors. Not bad. Stinky Socks: In the tasting video, Dan said it reminded him of good cheese. Don’t know where he got cheese from, but this was too awful to let it sit in my mouth long enough to compare. Lime: Never got one. I don’t think. Lawn Clippings: Didn’t taste like lawn clippings but didn’t taste like lime either. This had a strange oatmeal-y taste. Is that dirt? Is that a really bad lime? Buttered Popcorn: Specifically remember eating this as a kid and being grossed out. Still holds true today. Rotten Egg: This is the angriest I’ve gotten about candy. Why am I doing this to myself? Chocolate Pudding: Tastes like Cocoa Puffs. Canned Dog Food: Never got one? Strawberry Banana Smoothie: Tastes like an Orange Julius drink. Dead Fish: Putrid oily fish taste. I hate this. I am going to my room. Juicy Pear: Very good, vibrant bean. Maybe the best-tasting bean in the bunch. Booger: Apple-like bitterness, then a weirdly sweet aftertaste. Doesn’t taste like any booger I’ve ever eaten. Caramel Corn: A gift of sweet deliciousness before you’re back to eating garbage. Moldy Cheese: It’s a pretty close race but Spoiled Milk was definitely the worst of the dairy flavors. Damn it. Peach: Standard peach candy flavoring. Solid. Barf: The closest imitation barf I’ve ever had. Tastes just like the real thing. I was very upset after eating this. I don’t feel great about myself. Berry Blue: Never got one. Toothpaste: Tastes exactly like blue Crest toothpaste with the little sparkles in it. Well done. Licorice: Available only in the third edition. Tasted like licorice but was still almost as bad as its awful lookalike. Skunk Spray: Available only in the third edition. This was honestly a very well-executed torture. Immediately after biting, it releases a taste as noxious and painful as a skunk’s spray. Pretty amazing how they got something to taste how it smells. Also, leaves a terrible aftertaste that lasts for at least 10 minutes. Absolutely abhorrent. If Donald Trump wins the election, there’s gonna be a jar of jelly beans on the desk of the Oval Office just like Ronald Reagan had. Only this time, it will be BeanBoozled beans solely to prank world diplomats and to threaten other staff. “Eat that candy or you’re fired!” he’ll yell at them. Verdict: If you’re not a kid and even if you are, you don’t want or need this. If you have kids and they want this, make them wash your car first. Then ask if they’re on drugs.